Just a quick post to thank a bunch of folks. Greg Boston for help with updating firmware and other issues in recent weeks. Guy Cochrane ( www.devestore.net ) for graciously liaising with Miller to replace the Solo tripod that was too light for the 350. (We may yet have to upgrade to a bigger head as well, since a mere touch on the tripod handle still induces shaking - but the initial purchase was based on published specs that indicated the combination we first bought was adequate. Not so....it's much wiser to go for a much heavier tripod/head combination for the F350). VMI (Al Jones) for visiting asap (today) when we expressed concern about some OOF shots. (He figured the back focus was part of the issue, but Fujinon - via their Washington rep Joshua Ewing - was more than happy to ship the lens to Redondo Beach for testing and a 24-hour turnaround). All media since 1960. Formerly CP16/Nagra. Currently learning F350/Fujinon HSs18 x 5.5BRM, Mac G5 Quad and FCP Studio. Guy Cochrane ( www.devestore.net ) for graciously liaising with Miller to replace the Solo tripod that was too light for the 350. (We may yet have to upgrade to a bigger head as well, since a mere touch on the tripod handle still induces shaking - but the initial purchase was based on published specs that indicated the combination we first bought was adequate. Michael, what tripod combo were you using? Were you using the larger ENG (100mm) Solo legs or the smaller DV (75mm) Solo legs? I'm not an F350 operator but I was looking into possibly getting one of these legs. My tripod setup is an OConnor DV on Gitzo 340. Weight capacity isn't a big concern for me, but stability/vibration damping/rigidity is. My biggest problem is the Gitzo legs aren't torsionally stiff enough to prevent twisting on medium to heavy drag. This is really irritating! I think Nate Weaver is also looking into a larger tripod/head setup. I'm curious to know what you F350 operators are using because I think as a group you are probably more discerning about minute differences in tripod performance. I'm also looking. Was talking to Nate on the phone the other day and we discussed what each of us was looking for. I was leaning more towards a Sachtler 18 or 20 and he had indicated a preference for the O'Connor 1030. I suggested maybe going as far as the 1030HD (HD = heavy duty, not high def). In his area, there are a lot more opportunities to go out and try different set-ups to find one to his liking. FWIW, in the Texas HD Shootout, when I was operating the F350, it was sitting on a Miller Arrow HD head and was very smooth, but let's not hijack Michael's thread. Let us know for sure Michael when you get your lens back. That was one of my complaints with my original lens was that no matter how certain I was of critical focus, it just never looked HD sharp when viewing on a large monitor. I wound up buying an O'Connor 1030B and 25L carbon legs. 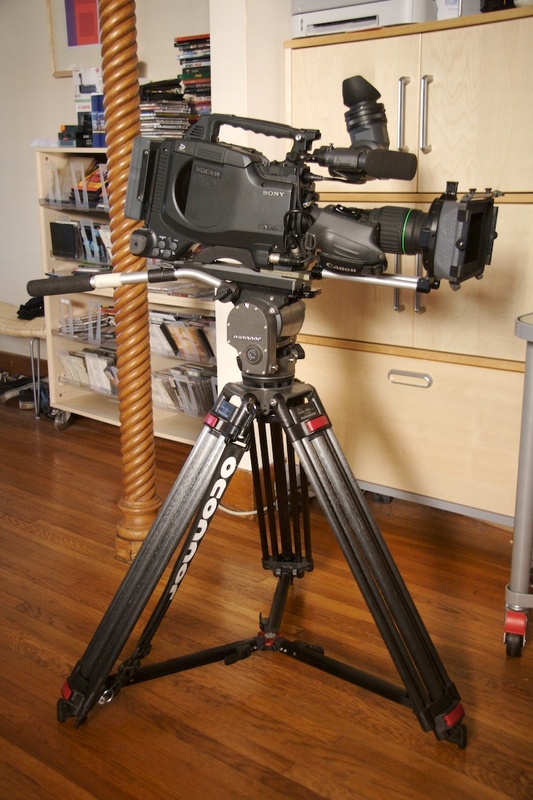 It was not cheap, although it was cheaper than the equivalent rig new from Sachtler. After driving around and trying a lot of Cartonis, Sachtlers and others, I realized that O'Connors was the one head I could go on the long end of the lens with, and get perfect moves and resistance from...Sachtler was close, but O'Connor was better. I use a Vinten Vision 5 head (not to be confused with the Pro 5) with Vinten Fibertec legs. The legs are amazing, rock solid yet very light with a very clever "U" Channel design. The head is a bit on the light side but is great for ENG work and run and gun wgere you don't want to lug around any more weight than you need to. 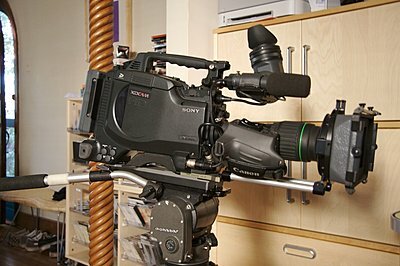 I am looking at getting one of the Secced Sachtler rip-off heads. Identical to the medium/big Sachtlers at less than half the price. 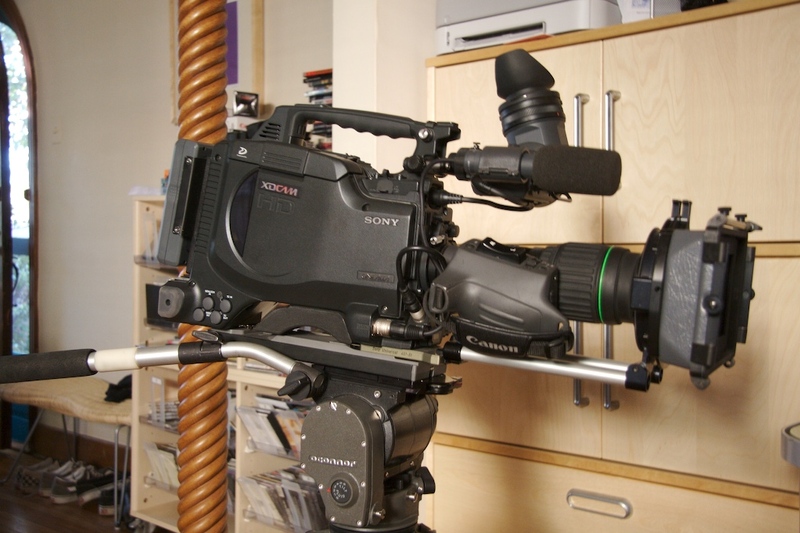 I am looking at getting one of the Secced Sachtler rip-off heads. Identical to the medium/big Sachtlers at less than half the price. Seriously though, I saw the pictures and wondered if it's truly a bargain. My concern would be longevity. They might perform identically when new, but how fast they wear out mechanically might be another story. I've had other tools from that part of the world and the metal alloys don't hold up very well with prolonged use. My concern would be longevity. They might perform identically when new, but how fast they wear out mechanically might be another story. Yeah, I'd definitely want to check one out in person also. Fluid heads live and die by the precision of the machine work. It would absolutely be possible to take a world class design and render it useless by not holding proper machining tolerances, etc. That said, my father runs a small vinyl manufacturing outfit, and they've had to start getting their molds from China because a mold that will cost say, $20K to get made in the midwest will cost them $4500 from their guy in China. And it's just as good. It's not a matter of CAN they make it as good (because they can), it's a matter of DO they? It was an Arrow 30 head (100mm) on the Solo tripod. The heavy-duty Solo. The Miller rep suspected it was the tripod that was primarily responsible for the shudder/shimmer in shots, so they were happy to swap us out for a more heavy-duty carbon-fiber unit with spreader. I'll post model number when I'm back in the studio next week. However, even with that switch, there is still a distinct movement in any shot at any focal length when I simply touch the handle. It is naturally most pronounced at the long end (full zoom). In retrospect, I'd say that combo would be more than adequate for something like a JVC HD100 (which we also looked at before opting for the F350). However, while you can use the camera baseplate adjustments and get perfect balance with the F350, and adjust the tilt and pan drag controls and get really great fluid motion, "support" is not the same as "torque control" and "inertia." By this I mean that there is definite leverage trasnmitted from the handle of any tripod, to the head...whatever model head you are using, and whatever weight of camera. The head therefore requires sufficient "inertia" (which can also be referred to as weight) to absorb the "leverage" and "torque" - in that order - that occurs when you grip the handle and begin to pan. (Pan is more sensitive to torque than tilt.....you can work out why for yourself....). Forgive me for repeating myself, but to put it another way, if the head is too light to handle this leverage, it will not have sufficient inertia and it will "torque" (twist) instantly...and your shot will be snafu-ed. So what's the bottom line? With an F350, I'd recommend a head that's rated for 50lb "carrying" capacity....(because such a head should be heavy enough to absorb all those fancy words I've been using)....and the sturdiest legs you can afford...even if budget-wise that means going for aluminum and a little extra weight rather than carbon fiber. More importantly - keep an eye on what others are saying here. Someone is going to come up with the "best" unit for this rig....and you do need the "best" to do justice to what this camera is capable of. Personally, I want a rig that will give me a steady shot at full zoom...but until we get the lens back, and then a heavier head for the legs we have, I won't be able to say for sure that we have achieved this.